Coloradans are drawn to the mountains and snow culture for various reasons: an appreciation of the natural world, a desire to remain active without laboring in a gym, and for many, the free-spirited, good-times-all-the-time atmosphere. Though we’ve seen the demise of a couple of Colorado’s rowdier romps (RIP 36 Hours of Keystone), there are still plenty of snow parties in the hunt for the ‘14/’15 season. Like these! Dew Tour The first major bash of the season brings the top freestyle skiers and snowboarders from around the globe. The party starts early, with on-mountain imbibing commencing each day at the T-Bar at the base of Peak 8. As for evenings, tour organizers will be bringing The Chainsmokers to The Riverwalk on Saturday, in addition to holding their "Snowboard Streetstyle" competition on Washington Ave. Other local action to watch: Brooklyn's Liquid Lounge at the La Cima Mall and "the club", Cecilia's. Dew Tour Breckenridge The first major bash of the season brings the top freestyle skiers and snowboarders from around the globe. The party starts early, with on-mountain imbibing commencing each day at the T-Bar at the base of Peak 8. As for evenings, tour organizers will be bringing The Chainsmokers to The Riverwalk on Saturday, in addition to holding their "Snowboard Streetstyle" competition on Washington Ave. Other local action to watch: Brooklyn's Liquid Lounge at the La Cima Mall and "the club", Cecilia's. Santa Ski Crawl Achieve fame and (maybe?) fortune as you help attempt a Guinness record for most-Santas-on-snow-at-once, and (definitely) enjoy endless succession of whiskeys. Lift tickets are only $22 for the day — an additional $25 scores you a Santa Suit and five free drinks on the ensuing pub crawl. (If you have the Rocky Mountain Super Pass+, you can use one of your three CB days to get on hill). You are also welcome to bring your own Santa suit, should you have one for some reason; but make sure it includes a top, bottom, hat, and beard. 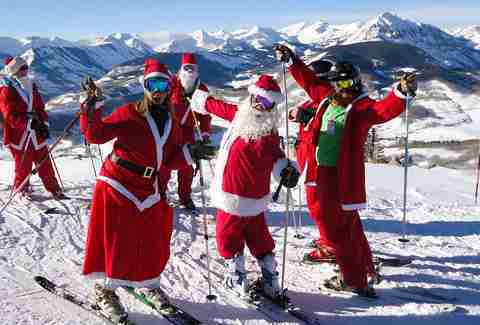 Santa Ski Crawl Crested Butte Achieve fame and (maybe?) fortune as you help attempt a Guinness record for most-Santas-on-snow-at-once, and (definitely) enjoy endless succession of whiskeys. Lift tickets are only $22 for the day — an additional $25 scores you a Santa Suit and five free drinks on the ensuing pub crawl. (If you have the Rocky Mountain Super Pass+, you can use one of your three CB days to get on hill). You are also welcome to bring your own Santa suit, should you have one for some reason; but make sure it includes a top, bottom, hat, and beard. Décimo begins Vail recently raised its standard of luxury even higher, quite literally, with the debut of Décimo last March. It's a nightclub redefined at over 10,250ft. Clubbers are invited to join the party at the base of Gondola One for a heated, Wi-Fi-connected ride to the transformed mid-mountain club. 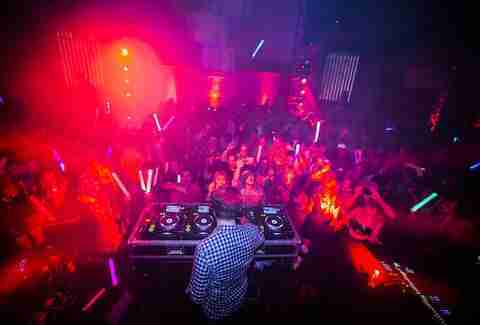 Following last year’s successful debut featuring famed DJ/producer Paul Oakenfold, Vail has expanded Decimo to a six-pack of dates spread over the course of the winter (12/31, 1/24, 1/30, 2/13, 3/6, 4/2), beginning with a NYE bash starring the electronic DJ duo, EC Twins. Décimo begins Top of Gondola One, Vail Vail recently raised its standard of luxury even higher, quite literally, with the debut of Décimo last March. It's a nightclub redefined at over 10,250ft. Clubbers are invited to join the party at the base of Gondola One for a heated, Wi-Fi-connected ride to the transformed mid-mountain club. 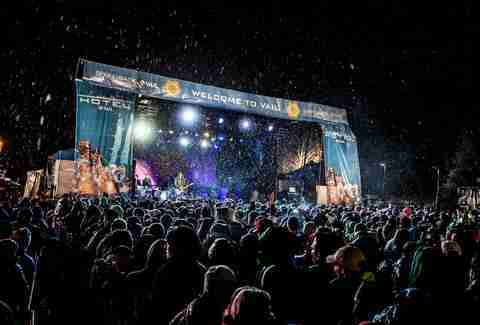 Following last year’s successful debut featuring famed DJ/producer Paul Oakenfold, Vail has expanded Decimo to a six-pack of dates spread over the course of the winter (12/31, 1/24, 1/30, 2/13, 3/6, 4/2), beginning with a NYE bash starring the electronic DJ duo, EC Twins. Ullr Fest For more than half a century, the town of Breckenridge has paid tribute to Ullr, the Norse god of snow, with its annual Ullr Fest. Centered around the Ullr Fest parade on Thursday January 15th (4:30pm), the festival brings over 10,000 people to Breck for a range of events, like the Ullympics (frying pan toss, ski boot relay, etc. ), Breck’s Got Talent, and an insanely long shot-ski attempt. Grab a Viking helmet, a spare liver, and a handful of friends, and prepare for a week of winter worship. Ullr Fest Breckenridge For more than half a century, the town of Breckenridge has paid tribute to Ullr, the Norse god of snow, with its annual Ullr Fest. Centered around the Ullr Fest parade on Thursday January 15th (4:30pm), the festival brings over 10,000 people to Breck for a range of events, like the Ullympics (frying pan toss, ski boot relay, etc. ), Breck’s Got Talent, and an insanely long shot-ski attempt. Grab a Viking helmet, a spare liver, and a handful of friends, and prepare for a week of winter worship. SIA SIA (or the SnowSports Industries of America Snow Show) is a special kind of circus that moved from Vegas to Denver a few years ago. Formally, it’s when all of the brands send their sales reps, riders, and execs to Denver for a weekend of "sales meetings". Yet, any good brand manager knows that a killer party drives more awareness than any trade show, which means there are plenty. Two have emerged as premier events: Snowboard Colorado Magazine’s rock and roll ripper at Summit Music Hall, and Snowdown at City Hall. SIA Colorado Convention Center and various venues, Denver SIA (or the SnowSports Industries of America Snow Show) is a special kind of circus that moved from Vegas to Denver a few years ago. Formally, it’s when all of the brands send their sales reps, riders, and execs to Denver for a weekend of "sales meetings". Yet, any good brand manager knows that a killer party drives more awareness than any trade show, which means there are plenty. 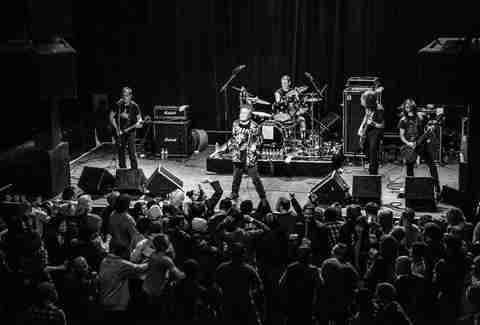 Two have emerged as premier events: Snowboard Colorado Magazine’s rock and roll ripper at Summit Music Hall, and Snowdown at City Hall. Burton U.S. Open One of the most storied contests in Snowboarding, the Burton U.S. Open's also famous for after-hours debauchery (a tradition Vail's kept up since the party moved west from Vermont). Start Friday night with $3 you-call-its at Garfinkel’s, and keep an ear on where the party is shifting. The DJ set at Dobson Arena is generally a first move for many, and the chaos spans the spectrum from there on out, from rounds of pool at The George to dance parties at Samana and possible pit stops at Frost inside the Sebastian Hotel. Burton U.S. Open Vail One of the most storied contests in Snowboarding, the Burton U.S. Open's also famous for after-hours debauchery (a tradition Vail's kept up since the party moved west from Vermont). Start Friday night with $3 you-call-its at Garfinkel’s, and keep an ear on where the party is shifting. The DJ set at Dobson Arena is generally a first move for many, and the chaos spans the spectrum from there on out, from rounds of pool at The George to dance parties at Samana and possible pit stops at Frost inside the Sebastian Hotel. Spring Back to Vail It's the closing weekend version of the ski-tourist’s Rocky Mountain dream — sunny turns in T-shirts; outdoor concerts; packed aprés decks; more beers than runs; and in this particular case, some world-class people-watching, as locals and visitors alike don ill-fitting costumes and do their damnedest to skim across an icy pond. 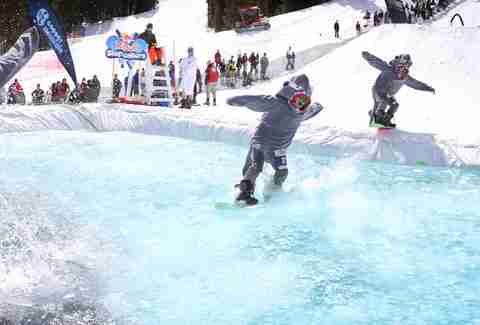 Vail’s "World Pond Skimming Championships" is the centerpiece of a weekend designed to tie off another successful winter, with one final bash in the Vail Village -- this time with a decidedly spring vibe. Spring Back to Vail Vail It's the closing weekend version of the ski-tourist’s Rocky Mountain dream — sunny turns in T-shirts; outdoor concerts; packed aprés decks; more beers than runs; and in this particular case, some world-class people-watching, as locals and visitors alike don ill-fitting costumes and do their damnedest to skim across an icy pond. 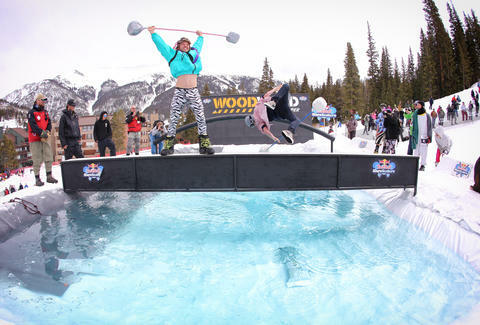 Vail’s "World Pond Skimming Championships" is the centerpiece of a weekend designed to tie off another successful winter, with one final bash in the Vail Village -- this time with a decidedly spring vibe. Red Bull Slope Soakers Kind of like the pond skim, but weirder: a frigid, man-made pond still lurks prominently as the main obstacle, but Slope Soakers throws in a kicker -- a rainbow rail and suspended jousting, adding plenty of additional opportunities for wipeouts. Less of an all-night party and more of an afternoon jammed with slams and laughs, it’s the perfect time to convince your friends one last time that "they’ve definitely got it". It's open to all who register and sign a waiver (available as the date draws nearer). Red Bull Slope Soakers Copper Mountain Kind of like the pond skim, but weirder: a frigid, man-made pond still lurks prominently as the main obstacle, but Slope Soakers throws in a kicker -- a rainbow rail and suspended jousting, adding plenty of additional opportunities for wipeouts. Less of an all-night party and more of an afternoon jammed with slams and laughs, it’s the perfect time to convince your friends one last time that "they’ve definitely got it". It's open to all who register and sign a waiver (available as the date draws nearer). 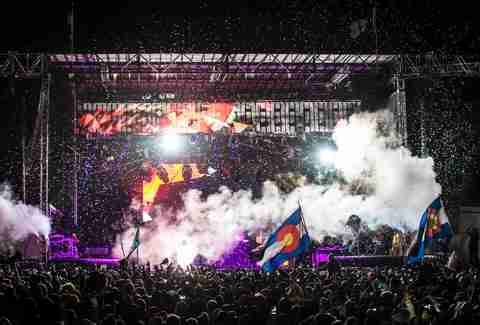 Snowball Snowball ran a three-year stretch as a rowdy mountain festival, but last year’s show was moved to Sports Authority Field where an estimated 7,500 fans a day enjoyed performances ranging from Pretty Lights and Knife Party to Warpaint and Busta Rhymes. The move was heralded by law enforcement for fewer incidents and arrests, yet many attendees left feeling that the city event "was just not the same". How that input will weigh remains to be seen. Location and other details to be released via their website. 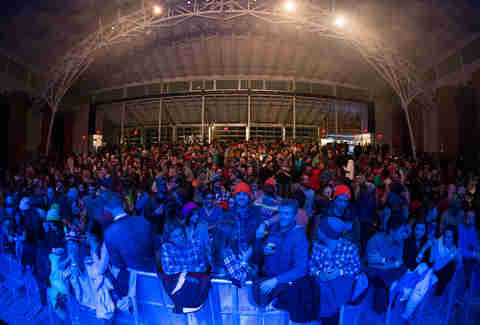 Snowball TBA Snowball ran a three-year stretch as a rowdy mountain festival, but last year’s show was moved to Sports Authority Field where an estimated 7,500 fans a day enjoyed performances ranging from Pretty Lights and Knife Party to Warpaint and Busta Rhymes. 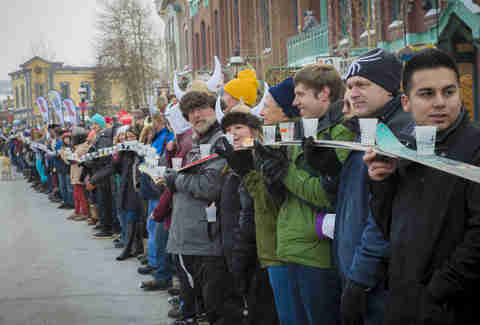 The move was heralded by law enforcement for fewer incidents and arrests, yet many attendees left feeling that the city event "was just not the same". How that input will weigh remains to be seen. Location and other details to be released via their website.